Leading Edge Games -- now defunct -- released a series of excellent role playing games based on popular movies. 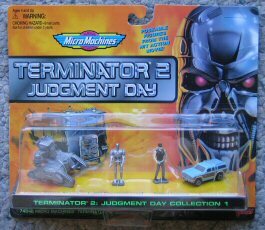 Terminator 2 was adapted into miniatures wargaming rules, allowing you to sling it out: Humans versus the robotic forces of Skynet. Human forces have an advantage in mobility, and terrain can allow them to choose their fights. 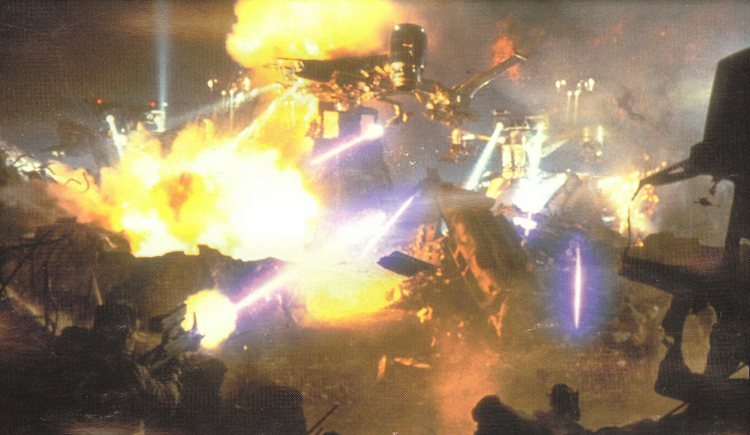 Skynet's forces must close and destroy the humans, using combined arms strategy with powerful, tracked, high-profile Hunter Killers supported by screens of Terminator troops (to disrupt human missile squads) and Flying (Aerial) HKs (as mobile concentrated force platforms to attack priority targets). 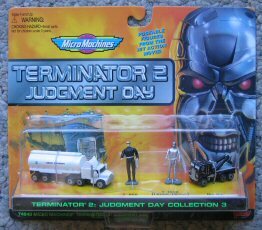 "2029, The Year of Darkness; the critical year in Humanity's war against Skynet's legions of Terminators and Hunter Killers. Now you can field your own armies in the battles that decide whether Man or Machine will triumph. 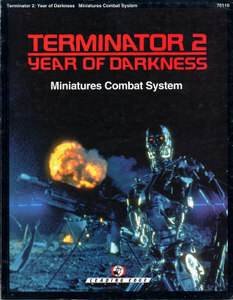 TERMINATOR: YEAR OF DARKNESS is a fast-paced game) of action and destruction in a brutal future, with everything you need for Miniatures battles between the armies of Skynet and the Human Resistance. Included are rules for Troops, Weapons, Vehicles and more, in a game that captures all the intensity of the film, yet can be learned in minutes. 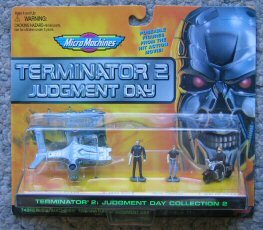 For Skynet, forces include numerous versions of the Terminator Endoskeleton, Flying Hunter Killers and Hunter Killer Tanks and even the dangerous Infiltrator Terminators. The Human Resistance fights back with everything from poorly trained and badly equipped Militia to elite forces equipped with stolen Skynet weaponry. A Points System allows players to build their own Terminator and Human armies, so you can create everything from small skirmishes to immense battles." "GURPS Robots contains detailed rules for designing, building, and playing robots -- from the tiniest nanobots to the mightiest megabots. You can create cyborgs, androids, and even biomorphs -- deadly fluid-metal machines that can take any shape. The advanced design rules are compatible with GURPS Vehicles, 2nd Edition. Choose everything from the frames to weapons to the tiniest accessories! 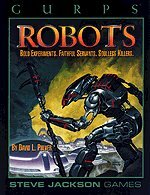 Also included are rules for robots as player characters; artificial intelligences and battlesuits; and over 30 completely worked-out sample robots." "It is 2047 A.D. The robot revolt is over, and the machines have won. Ruthless Artificial Intelligences have exterminated most of humanity, while the survivors are hunted like animals, or face slow death in the robots' brutal labor camps. But a lucky few have escaped death or enslavement. While most of mankind has succumbed to despair, some refuse to give up hope. Around the world small groups of dedicated survivors are forming, preparing to oppose the robot overlords and fight to free mankind. 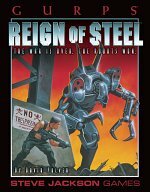 A worldbook for GURPS, Reign of Steel details mankind's struggle against his metal masters in a dark future. GURPS Reign of Steel utilizes the sleek rules from GURPS Robots, although you do not need Robots to play. Take on the role of the oppressed masses, and teach the robot overlords that technology can be made obsolete."